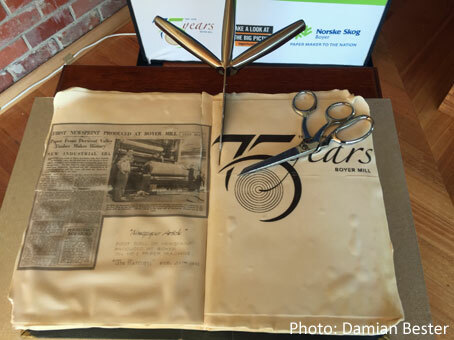 Norske Skog Boyer's 75th birthday cake. A WEEK-LONG celebration of the 75th anniversary of paper production at the Boyer Mill culminated with a family day for past and present employees and their families and an official function involving executives and local, state and federal politicians. More than 200 people attended the event, staged in the grounds of the Willow Court historic site at New Norfolk. Production of newsprint started at the Boyer Mill commenced in 1941, with the first successful test roll coming off the original paper machine on February 22 that year. Since that time, the mill has produced nearly 13 million tonnes of paper and provided thousands of jobs to four generations of Tasmanians. The mill remains one of Tasmania’s major industries and injects more than $175 million each year into the state’s economy in wages, salaries and expenditure on local goods and services. General manager Rod Bender said while it was great to celebrate the mill’s achievements it was even more important to acknowledge all the men and women who had contributed to that success over the past 75 years. “From the workers in the forests and plantations, to the staff, employees and their union representatives, to everyone involved in transporting our products and raw materials, to the thousands of contractors, suppliers and local business partners who interact with our business on a daily basis, to the governments and government agencies who have supported our business, to our owners who have continued to invest in our industry and our future opportunities and to the local Derwent Valley and Tasmanian communities for your acceptance and support, I say thank you," Mr Bender said. “It has been an amazing journey that has involved incredible changes to every aspect of our business. There have been significant advances in technology, industrial relations, work practices and pulp and paper quality, while at the same time we were rising to the ever changing expectations of our shareholders, our customers, our employees and the community," he said. “The mill’s longevity and success would not have been possible without consistent bipartisan support from the Federal and Tasmania Governments, the Derwent Valley Council and strong support from the local Derwent Valley and Tasmanian communities. I therefore say thank you to everyone who has contributed to helping the Boyer Mill reach this important milestone. What we have collectively achieved is very special and I encourage today’s generation to continue the tradition of working together to build a productive and harmonious future,” Mr Bender. said. The birthday week started on Monday, which was the actual 75th anniversary day. 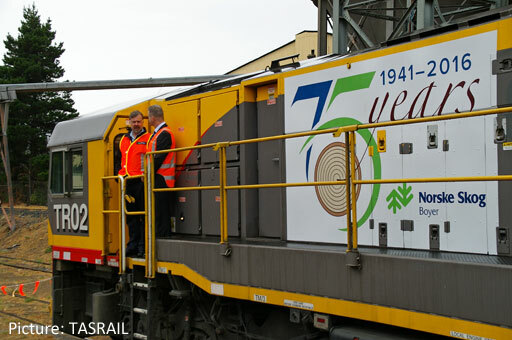 The state's rail company, TasRail, congratulate Norske Skog and unveiled special branding on one of its locomotives. TasRail chief executive officer Damien White praised Norske Skog for its achievement and for its sustained commitment to the state. “TasRail is very proud to supply rail freight services to this iconic Tasmanian industry,” he said. Mr White said the railway had enjoyed a long and successful association with the Boyer Mill throughout the decades. “Collectively our two respective industries have played a key role in the social and economic development of the state, particularly through the creation of economic and employment opportunities”, he said. Since TasRail’s re-establishment six years go, more than two million tonnes of paper has been railed between Boyer and the port at Burnie. “It’s a commercial partnership that continues to deliver value to the community and serves the Tasmanian economy well”. Mr White said TasRail looked forward to continuing to work with Norske Skog to meet the freight and logistics needs of the Boyer Mill for many years to come.